You know a red carpet premiere is extra glamorous when members of the British royal family are on the guest list. 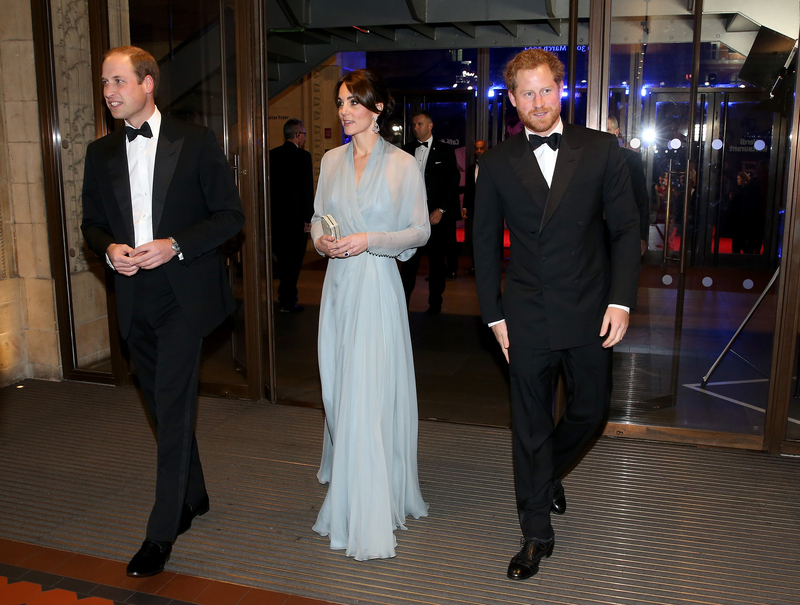 Kate Middleton, Prince William, and Prince Harry were at the Spectre world premiere in London on Monday night, where they were joined by the film's stars Daniel Craig, Monica Bellucci, and Lea Seydoux. The Spectre red carpet provided plenty of fabulous ladies in evening gowns and dapper gentlemen in their suits, which was a nice appetizer of sorts to all the red carpet glamour that's about to hit us when the 2016 awards season finally comes. One of my favorite looks of the night was worn by Middleton, who looked ethereal in a semi-sheer light blue gown designed by Jenny Packham. The Duchess of Cambridge loves Packham's designs and Middleton's Spectre dress was another stunning creation. She arrived to the premiere accompanied by her husband Prince William and brother-in-law Harry, who both looked James Bond-like in their black tuxes. Of course, the man who plays agent 007 in the film was there, too. Craig added a bit of patriotism to his tux by wearing a Royal British Legion poppy pin. His Spectre co-star Seydoux looked breathtaking in a sequined Prada dress while Italian beauty Bellucci was ever the bombshell in an emerald velvet gown designed by Ralph & Russo. They're a match made in heaven! But so are Middleton and her gown's designer Jenny Packham. The royal trio added an extra dose of glamour to the film's premiere. The French actress dazzled in Prada. I can't wait to see the rest of her Spectre promo looks. A solid look for the real life 007. She was there to support her husband Craig at his premiere, but still looked every bit a star. Harris is a knockout in this strapless tangerine dream. The award-winning crooner, who sings the Spectre theme song "Writing's On The Wall," looked extra sharp in his white blazer. Another British royalty... Dame Shirley Bassey. The screen legend looked fierce in fur while making her first public appearance since her sister Jackie Collins' death last month.